flail my arms in the air like Kermit when I say “YaaaaY” in my class. I’ve always had a soft spot for the Muppets and as an adult find Muppet Adult Humor found HERE and see it HERE to be hilarious – yet … shall I say … Colourful? 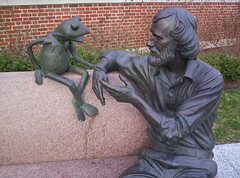 I learned from Jim Henson that muppets share the same feelings of loneliness as I did. Muppets also found humor in the same places I did. In many ways my family is EXACTLY the same as the Muppets. We share the same philosophy. For example, Cookie Monster explained his new philosophy that “Cookies are a sometimes food.” It was noted that he like Eggplant and fruit. How great is that? It means make the most of what you have. I love that. Growing up in my family meant to needed to not take things too seriously. That was hard for me. I was perhaps more sensitive than others and masked it with meanness to protect myself. I was always told I was too sensitve. While I could dish it out, it was hard to take it. Now, flippant comments are not important to me. I can take it and dish it as much as the next person, maybe more so. I try not to be too serious, I love the goofy-ness of life and see humor around ever corner. Our family trips were even more ‘less serious’ if that was even possible. Those trips were always like a Muppet Adventure complete with an odd assortment of characters.